Records as far back as ancient Greece tells of dogs fleeing the city of Helice before a tragic earthquake. China also has stories of dogs showing signs of distress before seismic activity. Although dogs are very much aware of their surroundings, some scientists argue that a dog’s hearing is so perceptive, they can hear rocks crumbling under the grounds surface. Some seismologists think that the dogs feel seismic activity through their paws. Either way, if a dog in an earthquake-prone area begins to act odd, the change in behavior shouldn’t be ignored. Just like with earthquakes, dogs can sense something on the horizon. Storms create an electromagnetic force that dogs can sense before the storm hits. Dogs also use their amazing sense of hearing and can possibly hear the thunder rumble from several miles away. Their olfactory senses are about 100 times more sensitive than that of a human and most likely can smell the electrical current in the air. Humans give off faint odors of illness, such as certain cancers and diabetes. It’s too subtle for another human to detect, but with the dog’s amazing sense of smell, they may sniff out something that may be off. 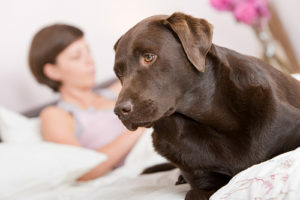 If a dog is sniffing a particular area on the owner’s body obsessively, a trip to the doctor should be in order. Some dogs are specifically trained to be seizure alert dogs. These dogs are taught to alert their owners before an impending seizure. Sometimes they even lie on top of their owners during the seizure and summon help when they can. Not all dogs are actually trained to recognize the signs of an impending seizure. They instinctively know what is going to happen, but no one knows exactly how a dog senses this.